Tuscaloosa. — Explore the visionary landscape of the medieval Book of Revelation with one of its eminent scholars, Dr. Richard K. Emmerson. Dr. Emmerson will deliver a public lecture, “Apocalypse Illuminated,” on Tuesday, September 11, 2018 at 6:30 pm in Smith Hall 205 on UA campus. Richard K. Emmerson is Dean Emeritus of the School of Liberal Arts at Manhattan College, former Professor and Chair of Art History at Florida State University, and currently Visiting Distinguished Professor at FSU. He has served as Deputy Director of Fellowships at the National Endowment for the Humanities and as Executive Director of the Medieval Academy of America, and has edited Speculum, Studies in Iconography, and Traditio. A Fellow of the Medieval Academy, he received the Medieval Academy Award for Excellence in Teaching Medieval Studies in 2009. 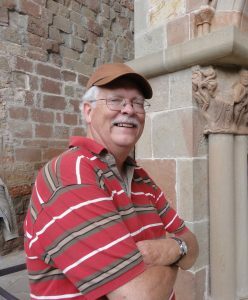 Dr. Emmerson’s research focuses on medieval apocalypticism and its representation in art, drama, and visionary poetry. He has published seven books, including Antichrist in the Middle Ages: A Study of Medieval Apocalypticism, Art, and Literature (1981), The Apocalyptic Imagination in Medieval Literature (1992, with Ronald B. Herzman), and The Apocalypse in the Middle Ages (1993, with Bernard McGinn). 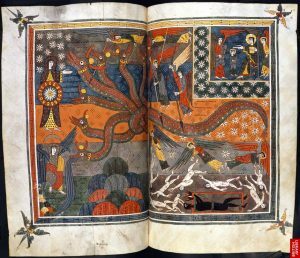 His most recent book, studying the seven-hundred year history of medieval Apocalypse manuscripts, is Apocalypse Illuminated: The Visual Exegesis of Revelation in Medieval Manuscripts, published by Pennsylvania State University Press in 2018. He has authored more than fifty articles, many studying word-image relationships in medieval illustrated manuscripts. Recent essays include “On the Threshold of the Last Days: Negotiating Image and Word in the Apocalypse of Jean de Berry,” in Exploring the Threshold of Medieval Visual Culture (2012); “Visualizing the Visionary: John in his Apocalypse,” in Looking Beyond: Visions, Dreams and Insights in Medieval Art and Thought (2010); “Framing the Apocalypse: The Performance of John’s Life in the Trinity Apocalypse,” in Visualizing Medieval Performance (2008); “Visualizing the Vernacular: Middle English in Early Fourteenth-Century Bilingual and Trilingual Manuscript Illustrations,” in Studies in Manuscript Illumination: A Tribute to Lucy Freeman Sandler (2008); “A ‘Large Order of the Whole’: Intertextuality and Interpictoriality in the Hours of Isabella Stuart,” Studies in Iconography (2007); and “The Representation of Antichrist in Hildegard of Bingen’s Scivias: Image, Word, Commentary, and Visionary Experience,” Gesta (2002). Image credit: Silos Apocalypse: Northern Spain, c.1100, British Library Add. MS 11695, ff.147v-148. Richard K. Emmerson’s lecture is part of the Visiting Artist and Scholar Lecture Series, sponsored by the Department of Art and Art History, the College of Arts and Sciences and the College of Continuing Studies at The University of Alabama. To see our past and future visiting artists and scholars, go here: https://art.ua.edu/resources/visiting-artists/. Smith Hall, 427 Sixth Avenue, Tuscaloosa, is a four-minute walk from the Campus Drive Parking Deck and Bus Hub on Hackberry Lane. Information about visitor parking is available here: http://bamaparking.ua.edu/visitor-information/. For more information on this or the other speakers in our upcoming Visiting Artist and Scholar Series, contact Rachel Dobson (rachel.dobson@ua.edu) or Pete Schulte (pschulte@ua.edu).